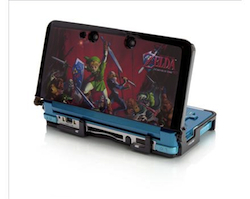 By now it’s obvious that we’re probably not going to get a Zelda-themed 3DS anytime soon. However, that hasn’t stopped one company from bringing some Zelda flavored goodness to the 3DS. PDP has released a fancy Zelda-styled “crystal armor” to dress and protect your beloved 3DS. The case has a soft inner layer to keep your system scratch free, as well as a hard outer shell to protect it from normal wear and tear. The “armor” comes in two different styles and is currently retailing for $14.99 at GameStop’s online store. Similar Phantom Hourglass-related offerings for previous DS models were really neat, so if you’ve already got a 3DS and hope to trip it out Zelda style to make up for the lack of a true Legend of Zelda model, this might be just what you need.